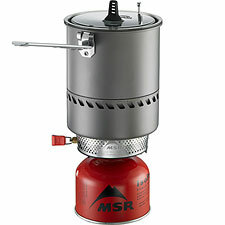 Winner of a 2007 Backpacking Magazine Editor's Choice Award, MSR's patented Reactor is an integrated canister stove designed to be windproof. The Reactor employs both a heat exchanger and a pressure regulator to deliver superior performance and efficiency in wind, cold, and high altitude—that is to say, the Reactor is built to thrive in all the environments that give traditional canister stoves fits. You might think of the Reactor as a Jetboil PCS stove on steroids. The Reactor takes the Jetboil's integrated design and ups the ante, with more wind protection for the burner, plus a pressure regulator to improve cold weather performance. On my scale, the Reactor weighs 1 pound, 1.5 ounces, fuel not included—a modest 2.5 ounces more than the Jetboil. That weight includes the integrated cook pot and lid, plus the included camp/cook towelette which MSR recommends using to protect the burner head when it is stowed within the pot. Also like the Jetboil, everything plus one can of fuel stows inside the cook pot. For in-the-field testing, I carried the Reactor on a group ski of Mount Baldy with several friends. We spent quite a bit of time working just off the summit, and we also spent an hour around 9700' melting snow and heating water to make tea. The wind was kind enough to kick up for the later half of our marathon tea-drinking session, and we boiled quite a few liters of water to satisfy the hydration needs of five very thirsty people. The Reactor has a formidable heat output. You'll need to bring your own lighter, as the Reactor is sans-auto igniter, but once you do get this stove to flame up, expect a raging inferno of output—and expect very short boil times. While I did not conduct direct comparisons, I would not be surprised if the Reactor boils a liter of water even faster than the already-speedy Jetboil. Unlike the Jetboil PCS, however, the Reactor does not seem to know how to slow down. The Reactor seems primarily to operate at one speed, Full Power, with little to no simmering capability. This will not be an issue if your goal is to boil water—quickly—in large quantities, but it does reduce efficiency if you are trying to melt snow, for example (as we were). Additionally, obviously, it renders the Reactor unsuitable for gourmet camp cooking duties. As mentioned, the wind did kick up as the sun began to set, and the introduction of a cold wind upon our unprotected Reactor stove proved enlightening. Yes, the Reactor's flame head is very well protected from wind—much more so than the Jetboil's. However, the Reactor's cook pot is uninsulated, unlike the neoprene-clad Jetboil pot. And this did indeed seem to make a difference, as boil times worsened significantly in wind, MSR's claims notwithstanding. To be fair, I would not expect the Jetboil to do much better unprotected in wind either. Perhaps the most reasonable conclusion to draw from this experience is that cooking unprotected in windy conditions is a fool's game no matter what stove you're using. Still, at the end of the day, the Reactor chewed through quite a bit more fuel than I was expecting, likely a direct consequence of its no-simmer snow melting and the cold wind acting on the cook pot. After using the Reactor in conditions both fair and foul, my initial take remains the same: I think this is best considered a group rather than solo stove. I have heard rumors the Reactor is proving popular on high-altitude expeditions. In any case, expect solid (for a can stove) performance in cold weather thanks to the Reactor's pressure regulator. In wind, as with any stove, you're still best advised to find shelter—though the Reactor is unlikely to flame out on you. The Reactor offers the convenience and ease of a canister stove, and it can be expected to excel in any situation in which you want to boil a lot of water very quickly. It can also be expected to perform at least adequately in weather conditions that most canister stoves flatly cannot manage. If you need to melt snow, however, or simmer, or perhaps achieve the very best fuel efficiency possible, I do tilt toward the Reactor's kissing-cousin competitor, the Jetboil...provided you can get out of the wind.